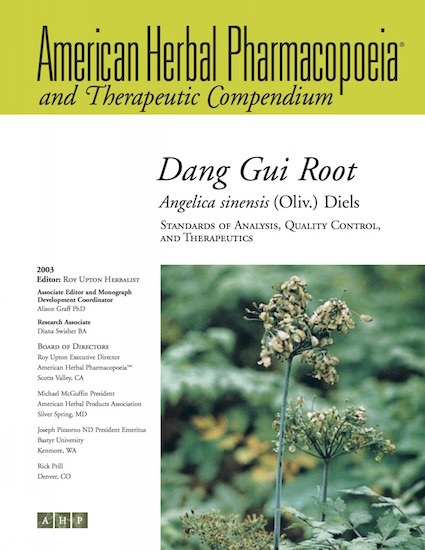 Dang gui (dong quai; Angelica sinensis), known by the Standard Common Name dong quai, is one of the most popular Chinese herbal medicines. It is primarily renowned for its use in the treatment of a wide variety of gynecological conditions that are generally not easily treated with conventional therapies, such as uterine fibroids, ovarian cysts, endometriosis, and infertility. Dang gui is especially important because it fills a therapeutic niche not readily addressed in Western conventional or herbal medicine. It has been used successfully for several hundred years, and can broaden therapeutic options for women beyond hormone replacement therapies and hysterectomies. Hopefully, increased use of dang gui and its appropriate formulas will help to reduce at least a portion of the 600,000+ hysterectomies performed annually in the USA. Unfortunately, there is not a lot of scientific data on the use of dang gui in gynecology, which is curious considering the predominance of its use. Available information is presented in the AHP monograph. For example, there is human clinical data on the use of dang gui and its constituent ligustilide for relieving pain associated with dysmenorrhea, as well as data supporting its positive benefit in restoring fertility to women suffering from tubal occlusion. Because of its effects on gynecological issues, there is considerable misinformation regarding whether it elicits its effects hormonally (predominantly it does not) and there has been conjecture that it contains phytoestrogens (which it does not). Each of these concerns is addressed in the Therapeutic Compendium. Like all Chinese herbs, there are many different grades and qualities of dang gui, including whole roots with rootlets, roots sliced without rootlets, bodies only, tails only, pressed and sliced roots (very poor quality), and roots that are sulfured or unsulfured. This monograph provides the information necessary for assessing dang gui herb quality.